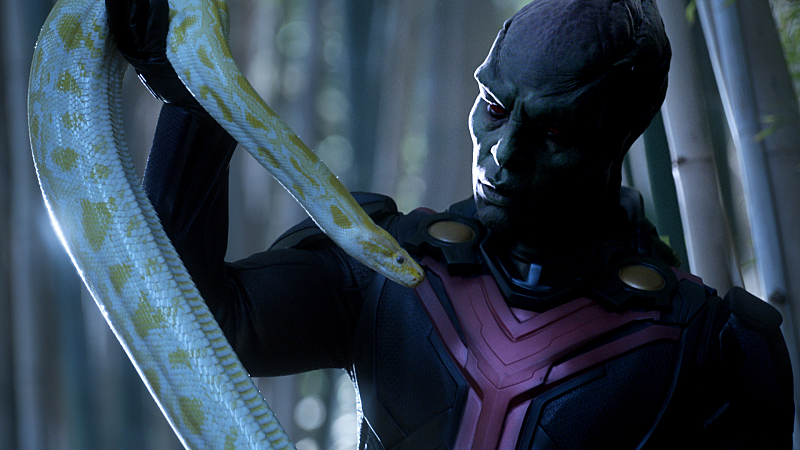 "Manhunter" -- J'onn J'onzz reveals the details of meeting Kara and Alex's father, Dr. Jeremiah Danvers, and assuming Hank Henshaw's identity, on SUPERGIRL, Monday, March 21 (8:00-9:00 PM, ET/PT) on the CBS Television Network. Frame Grab: ÃÂ© 2016 WBEI. All rights reserved. Melissa Benoist leads the cast of Supergirl as the title character alongside Mehcad Brooks as James Olsen, Laura Benanti as Alura Zor-El, Calista Flockhart as Cat Grant, Chyler Leigh as Alexandra “Alex” Danvers, Jeremy Jordan as Winslow “Winn” Schott, Jenna Dewan Tatum as Lucy Lane (sister of Lois), David Harewood as Hank Henshaw, Peter Facinelli as Maxwell Lord, with Dean Cain and Helen Slater. Supergirl airs Mondays at 8 PM ET on CBS. If you missed an episode of Supergirl, or just need a refresher, be sure to check out our weekly recaps by clicking here.